Convergence starts to wind down in issue 4 and Warlord plays a major part in it all. This article contains spoilers! Today's issue of Convergence, DC Comics' mega-event that gives fans a chance to revisit 75 years' worth of alternate timelines and versions of their favorite heroes, kicked the final battle into high gear, gave Earth 2 (if it survives) a new Batman and showed us yet again why the characters of Mike Grell's The Warlord are some of the most awesome and underused in DC's pantheon. Writer Jeff King joined us to discuss the issue. If you aren't caught up on our previous installments yet, covering Convergence #1, 2, 3, and 4, check them out here, here, here and here. You can also check out an exclusive gallery of spoiler-heavy pages from the issue below our interview. Given his connections to Flashpoint, was it really cool to get Andy Kubert to draw this issue? Absolutely. That was a stroke of genius from Dan DiDio and Marie Javins, and my good luck that he said yes and agreed to jump in and do #5. Talk about a dream artist to come on, especially to do the Warlord and to do Skartaris but also to connect to all the characters from the Crisis; It couldn’t have been a better choice. As the Skartaris story seems to be winding down, we finally get eyes on more of the Dome-dwellers. Was keeping them off the board during the Warlord stuff done on purpose so that the lesser-known characters like Telos, Warlord, Deimos and the Earth 2 characters could get development? Partly. It was partly conscious but it was partly dictated by the story. We know that until the end of Week Four, not all of the characters from the monthly stories were out of their domes. Even though they’re all listening to the same announcement from Telos, just reading through the event you wouldn’t have the sense of completion that all of them had kind of been through their initial period. By the time we were getting to the end of #4, beginning of #5, it felt like the perfect time to let everyone who was out there on the surface become part of the bigger story. So buckle up; as we move along, you're really going to get that sense that everybody who has been connected to all these events you reference are all going to be pulled into the story. What it also did was it allowed our Earth 2 team to really bond with each other. It allowed Grayson and Telos to share a lot of history and connection, and of course that’s all going to be important for what comes next in the storytelling. Of course for me to have Andy Kubert draw this amazing moment where Grayson takes up the mantle of Batman by smearing the ashes of a burned-out battlefield onto his chest, that was a pretty magical moment for me. The notion of Telos having an identity and a name before all of this evokes Silver Surfer, or even what Geoff Johns is doing with the Anti-Monitor right now in Justice League. Is that on purpose? It was part of a larger kind of trope of storytelling and unconsciously I guess I ws tapping into that, but even more powerfully, I felt like what that does is put Telos squarely on our side. Not only has Deimos done his heel turn, but it really kind of makes them in a way sort of Cain and Abel as they’re both in some sense a creation of or empowered by Brainiac to become what they are. So in a way , Telos is kind of like a guy who in a certain sense almost sold his soul to the wrong devil for the right reasons. Is Brainiac's role here done, or will we see more of him -- pissed because of how he was shunted off stage here and in Futures End? Without spoiling anything, I can say this is not the last time you're going to see Brainiac before the end of Convergence. What's the deal with the Blood Moon? We got that reference in Futures End as well. Well, I would say that you could look at issue #5 where we talk about the Blood Moon, it’s really almost more like a physical thing. The event itself coincides with Brainiac’s arrival and as we’ve seen from Futures End, the Blood Moon was his mode of transportation throughout the universe and so that not only was an event but also how Telos and his people perceived the arrival of Brainiac’s ship in their orbit. Lots of powerful people, unstable elements popping up here and in the monthly books. 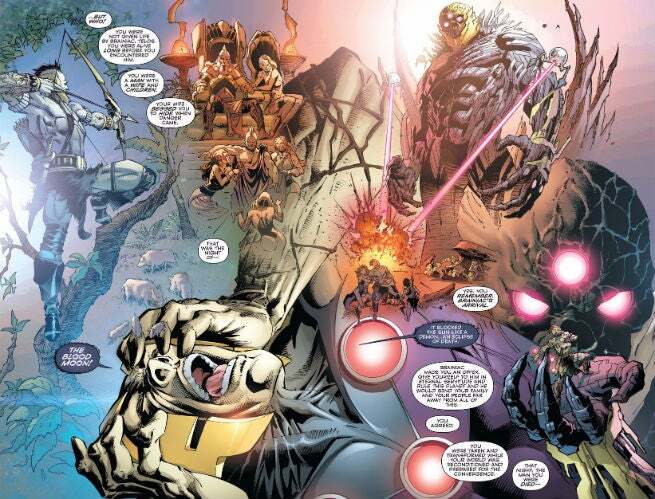 How many mad gods can we have, between Deimos and Brainiac -- or even with somebody like Parallax, who was at the height of his power and his crazy when Zero Hour happened? Would it surprise you if I said sooner or later, they might find themselves in the same place? Can you imagine all that power in one spot? And you also have Deimos, who really is revealing himself to be not only a god in some ways but a really bad guy. Not only a usurper, but also a traitor in every sense of the word. It was really awesome to see Morgan go out in a blaze of glory...and then revert to the dust which he was the last time we saw him. I was talking about this with somebody the other day: Are these actually taken from the original worlds we read in publication, or just the next closest thing in the mutliverse? I’m not sure I totally understand the question, but they are slivers of those original words. So they are I guess in the sense that until Gotham is repopulated onto the earth from which it came, it is the closest approximation to that previous timeline as we will get. The series is eventually going to answer those questions. I guess what comes through it in a way is that the characters are [the originals]. 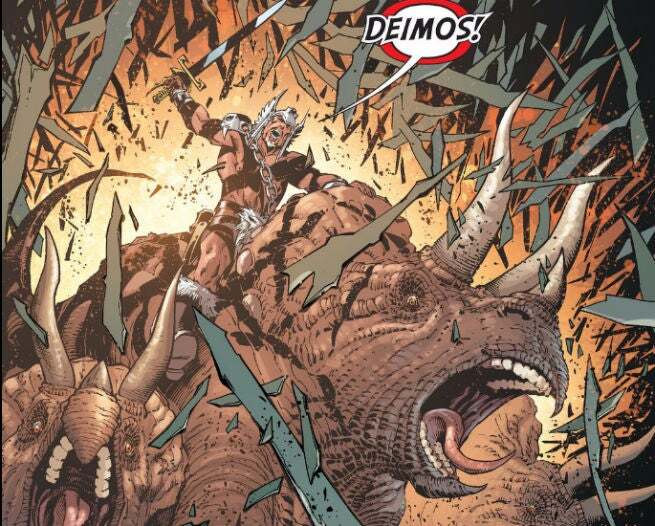 The dark, horrible future that Deimos sees: Is he looking at the Post-Convergence DCU or just what he WANTS to see? He is looking into the future that he imagines, so this is I guess you can say his version of post-Convergence, which is not what everyone else’s ideal version is. It’s not what Brainiac’s version would have been and it’s not what Telos’ version as Brainiac’s proxy would have been. It’s also not what, in #6, Grayson’s version is, for example. In a funny way, Grayson is the one who kind of can most shape that the most until Telos is ready to make his own decision.